I also got a lot of stitching done on the road. I love that time to talk with my husband and sit and stitch uninterrupted (well, mostly uninterrupted). Thank heaven I don’t get car sick. And now, back to the craziness at home. Time to catch-up on laundry, emails, school work etc. Sometimes I think you need a vacation to catch-up after your vacation. So pretty, I love southern Utah. I don&#39;t get down there nearly enough anymore! I love the old quilts you can see in all the old pioneer buildings. Such magical scenery. Just look at those blue skies. Good luck with laundry. Sounds like a perfect weekend! Your photos are beautiful. When I was a kid, we lived in So. Cal. and I used to love the drive up to St. George — right through Santa Clara with it&#39;s fruit stands and pioneer homes. Then the built the interstate and took all the fun out of it! How fun! My grandma lived in St. G. for most of my childhood, a few blocks from the temple. I love visiting the pioneer sites. Cove Fort has some pretty quilts too and I got some ribbing about taking photos of them.<br />Are you making a family tree? Where did you get it? Wonderful pictures! I&#39;m looking forward to the next block! I am h oping we will be moving to Utah later this year, then I can spend all my long weekends out there adventuring as well. Thanks for sharing the photos. Glad you had fun and hooray for stitching time! Looks like you had pretty weather too. 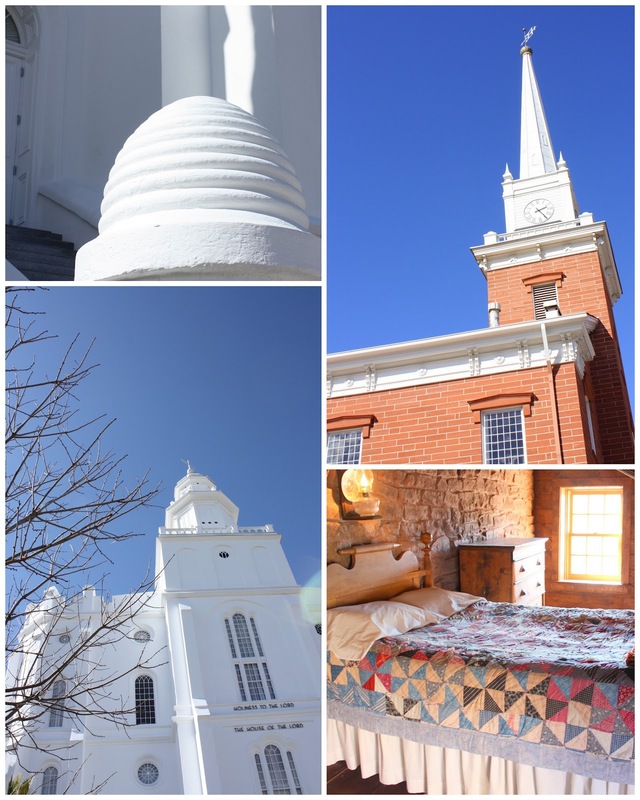 I saw and took pictures of many quilts in the Brigham Young Winter home when we were in Southern Utah last April. We had snow coming back up towards SLC from there. Nice you missed the snow this trip. I&#39;m working on my Block as I read your post, I had to come back online and re-read the directions. So fun to see pictures of St. George. 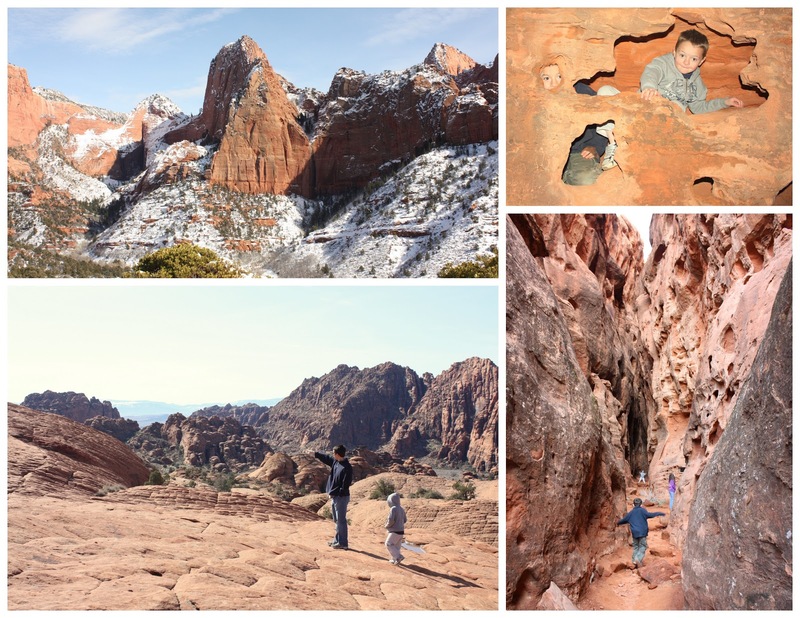 Our house was quite near Snow Canyon, and I used to love to go walking there. I think it&#39;s a well kept secret, and still one of my most favorite places to hike. I&#39;m glad you had a good time with your family and also had time for some stitching. The perfect balance. Thanks for sharing your pics.